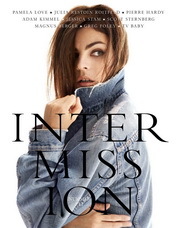 Intermission offers its second issue; a mix of fashion, culture and talent. A bilingual title in which translations from the Swedish of the lead articles are printed in the back in English, this is an issue that is less focussed on the usual celebrities and instead turns its gaze on talent largely operating behind the scenes in the world of fashion and culture. For example, there is an article on Johan Svensson, Art Director of French Vogue who waxes lyrical on everything from following in the footsteps of Fabien Baron to training as a designer in Sweden. Gaia Repossi chats about everything from yoga to her challenging role heading up the luxury jewellery house of Repossi and Vanessa Traina – one of the high-profile daughters of blockbuster writer Danielle Steel- talks about almost becoming a ballerina and working with Joseph Altuzarra, the ex-Givenchy designer who has generated a great deal of buzz for his own collections of late. You get the picture: the idea is one of offering a three-dimensional personality; an intimate portrait, as it were. And, in the case of the ‘portrait’, this can also be quite literal. For example, in addition to the interview, the stunning Vanessa Traina styles herself in a range of looks by the likes of Prada, Alaia and Alexander Wang for the shoot by John Scarisbrick. The interview with DJ phenomenon Michel Gaubert. The brainchild of Daniel Magnussen, whose association with a magazine called HE seems to be a big deal locally, the idea is that Intermission will, in Magnussen’s opinion, bring an important addition to the Scandinavian publishing scene by having a strong point of view. Again, I guess only time – and translations or reading Swedish- will tell whether his view of his publication is accurate or not, since, on the face of it, it appears to be a fairly middle-of-the road publication for some of the efforts coming out of Scandinavia these days. Over-sized with a simple unpretentious art direction, the fashion photography tends towards the direct and simple aesthetic associated with the region. One thing that does seem notable about this publication, however is that it seems to focus heavily on celebrities and talents from outside of northern Europe, making it somewhat unusual for a Scandinavian magazine.